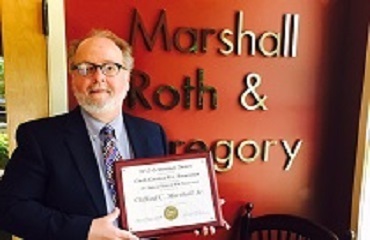 Kip Marshall received the The North Carolina Bar Association's Centennial Award for 2015 at the Annual Meeting of the 28th Judicial District Bar in Asheville. The Centennial Award honors an individual member of each judicial district in North Carolina for outstanding service benefitting the local community. Examples of such service include: elected and/or appointed service to local government; civic involvement on boards of community agencies; involvement in public service projects; and volunteer involvement with schools, churches, or other nonprofit organizations. In earning the Award, Kip was recognized for his service both by serving on various governmental working groups affecting the legal profession, and to local schools and non-profit organizations including Asheville Catholic School, The Mediation Center (where he served as President), and Manna Food Bank. The Award is given in honor of the 1999 centennial of the North Carolina State Bar. Kip joins a distinguished list of attorneys upon whom the Centennial Award has been bestowed, including the late Roy W. Davis, Jr., Judge Dennis Winner (ret.) and the late Ward Hendon, among others.